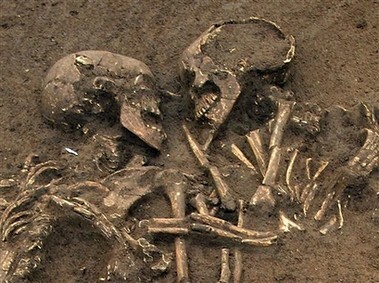 Allan R. Bevere: Should Ancient Human Remains Be Allowed to Rest in Peace? Should Ancient Human Remains Be Allowed to Rest in Peace? The study of human remains, both historical and pre-historical, is a surprisingly divisive enterprise. It's a practice whose ethics spark fierce debate and strong views about what is morally acceptable among experts and laypeople alike. It is also an exercise that can reveal priceless information; it can help historians figure out "who done it" in ancient murder mysteries. It can reveal what kind of life that person and their community lived. And, with the help of more recent DNA techniques, it can allow biologists to trace the very origins of human evolution. But amidst the all this potential, it can be easy to forget that the remains are what's left behind of a person who lived a life and may have living descendants. Cultural attitudes and sensitivities vary around the question of whether human remains — once discovered — should be kept and studied, reburied or a combination of the two. This is an especially delicate question when it comes to the remains of American Indians. The historical abuse of burial grounds, which were routinely ransacked for study in the late 19th Century, can be tough to reconcile with the scientific value of groundbreaking discoveries.